Proofpoint threat researchers recently detected a new addition to PoS malware landscape. Named AbaddonPOS by Proofpoint researchers, this sample was initially discovered as it was being downloaded in the process of a Vawtrak infection. 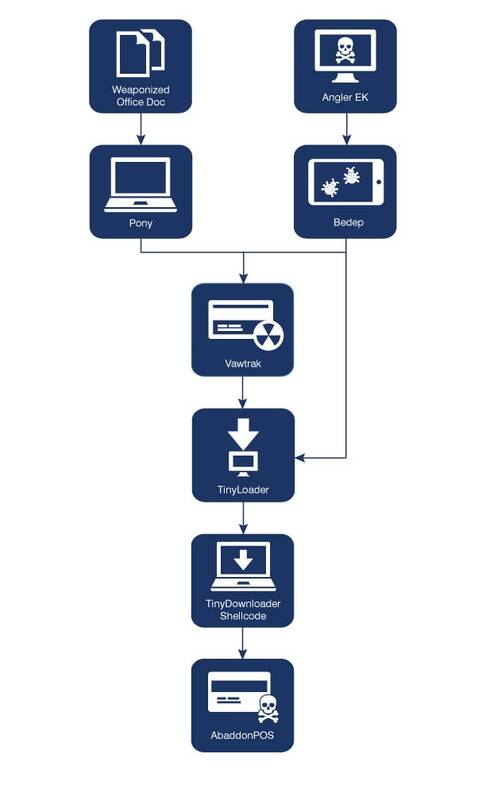 This use of additional payloads to enhance attack capabilities offers another example of efforts by threat actors to expand their target surfaces through the delivery of multiple payloads in a single campaign, in this case by including potential PoS terminals. This post will analyze AbaddonPOS; discuss the observed infection vectors; and expose, details on the downloader used to retrieve this new PoS malware. We will also provide evidence to demonstrate that the downloader malware and PoS malware are closely related, perhaps even written by the same actor or actors. On October 8, Proofpoint researchers observed Vawtrak  (project ID 5) downloading TinyLoader, a downloader that uses a custom protocol for downloading executable payloads from its command and control (C2) server. TinyLoader was then used to download another downloader in the form of shellcode, which then downloaded AbaddonPOS. Although this infection vector was initially specific to Vawtrak’s project ID 5, we have also since observed it delivered in project IDs 6, 9, 10, 12, and 13. The project ID’s are most easily observed with Vawtrak C2 traffic, as they are stored encoded in the PHPSESSID cookie value. Using the cookie value we provided as an example in our research on Vawtrak enables us to see it in a decoded state (Fig. 1). Bytes 4-7 contain the project ID in little-endian byte order. In addition to observing AbaddonPOS as it was delivered by an Angler EK → Bedep → Vawtrak infection (Cyphort, ) and Angler EK → Bedep (bypassing Vawtrak), Proofpoint researchers have also observed this infection behavior delivered by weaponized Microsoft® Office documents downloading Pony → Vawtrak (Fig. 2). TinyLoader’s sole purpose in this infection chain is to retrieve executable instructions from the C2, which allows the attackers to execute their own custom shellcode on infected machines in addition to downloading and executing additional malware payloads. True to its name, TinyLoader is typically 2-5KB in size. One notable characteristic of TinyLoader is that prior to contacting its single hardcoded C2 IP address, the malware will first check to see if it is running as an x64 or x86 process using the IsWow64Process Windows API (Fig 3.). TinyLoader selects a value based on the result of this API call, and the result is then used to tell the C2 which executable code should be downloaded to the infected client. Once the persistent payload is written to disk, another payload is downloaded by TinyLoader in the form of shellcode (Fig. 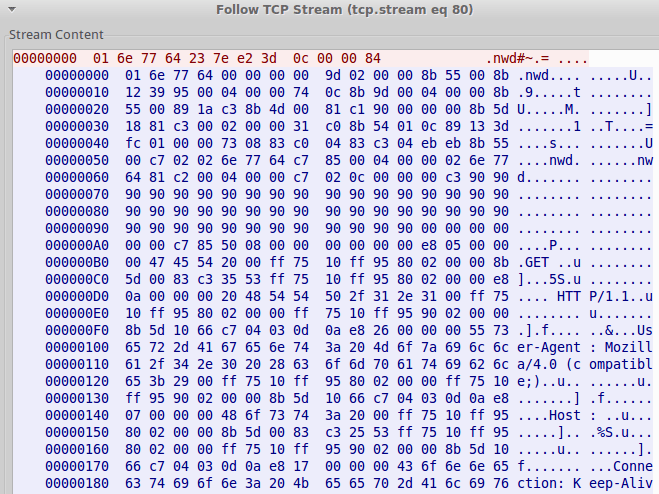 5), the purpose of which is to manually craft a HTTP request that is then used to download an AbaddonPOS payload (Fig. 6). AbaddonPOS is another addition to the PoS malware category, which has attracted a significant amount of attention from malware authors over the years. Similar to TinyLoader, AbaddonPOS is a relatively small package, with most samples being 5KB in size. While the core functionality of this new addition is fairly simple, it contains several features that merit analysis and further discussion: anti-analysis, code obfuscation, persistence, locating credit card data, and a custom protocol for exfiltrating data. AbaddonPOS implements several basic anti-analysis and obfuscation techniques to hinder manual and automated analysis techniques. For example, AbaddonPOS employs a CALL instruction to push a function parameter onto the stack rather than simply using, for instance, the more common PUSH instruction. A CALL instruction pushes the next address onto the stack, which is typically used as a return address following a RETN instruction. In this case, the CALL instruction is used to push the address containing a string (Fig. 7): specifically, the address containing the string “devil_host” is pushed onto the stack, which is then used as a mutex. Most of AbaddonPOS’ code is not obfuscated or packed, with the exception of the code used to encode and transmit stolen credit card data. This shellcode is encoded using a 4-byte XOR key; however the key is not hardcoded. Instead, using the first 4-bytes of the decoded shellcode, the malware iterates over all possible 4-byte XOR keys until the correct one is found by checking the result against the hardcoded instructions: 0x5589E58B (Fig. 8). Once the XOR result matches the hardcoded instructions, then the correct key has been found and the malware continues to decode the shellcode using that key. The AbaddonPOS sample with md5 hash: f63e0a7ca8349e02342c502157ec485d was analyzed for the process above. The slightly older version of AbaddonPOS may contain slightly modified functionality, including not allowing “D” as a track 2 delimiter. Although many of the different PoS malware families rely on HTTP to exfiltrate data, AbaddonPOS uses a custom binary protocol. Communication and exfiltration of credit card data is carried out by the decoded shellcode discussed above. A single hardcoded IP address is used as the C2 address, as well as the encoding routine that is used to obfuscate exfiltrated data. An example of the network traffic generated during a single credit card data exfiltration attempt is shown in Figure 9.As a result of this analysis, Proofpoint created and published ET Pro IDPS signatures (ID’s 2814677-2814680) to detect exfiltration attempts on October 30. To encode the data, the malware first XORs four bytes of the plaintext with the process handle, followed by a second XOR with a hardcoded 4-byte key. The exfiltration network traffic in Figure 9 is shown in its plaintext state in Figure 10. Of the samples Proofpoint researchers have discovered and analyzed so far, very few samples seem to have had any functionality added or removed. While “devil_host” is the most prominent mutex used by this malware, we have also found a sample that uses “devil_kor” (md5, a55843235cd8e36c7e254c5c05662a5b), and another that uses “DeviL_Task” (md5, ac03e0e9f70136adede78872e45f6182). We also observed a slightly updated version of AbaddonPOS (see IOCs) where almost all functionality was relocated to the encoded shellcode. 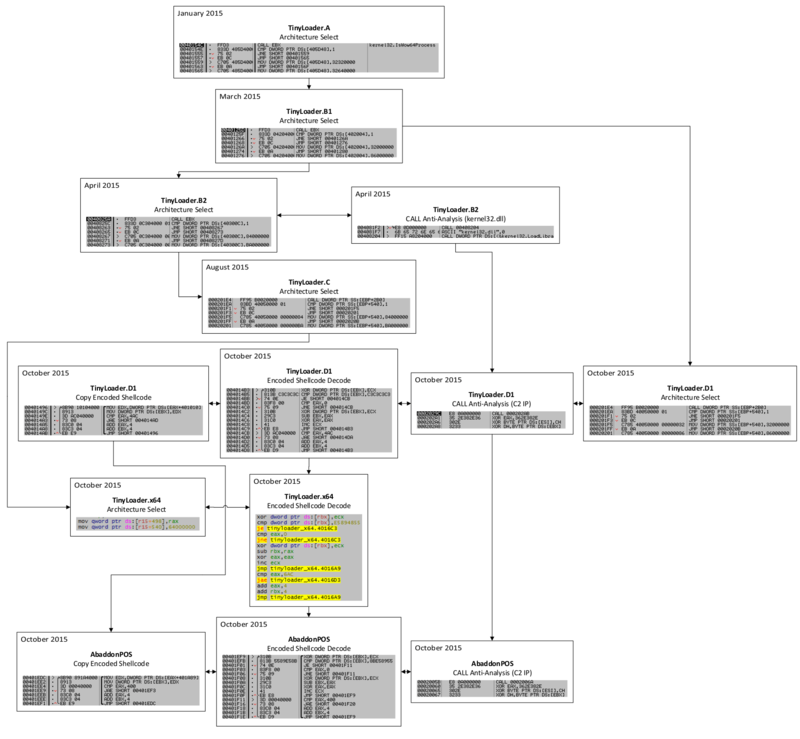 In these updated samples the mutex “MG_REX” was used and the credit card search algorithm was also modified by adding ‘D’ as a valid track 2 delimiter. The similarities with code excerpts including a timeline according to Proofpoint data are provided below (Fig. 11). The practice of threat actors to increase their target surfaces by leveraging a single campaign to deliver multiple payloads is by now a well-established practice. While using this technique to deliver point of sale malware is less common, the approach of the US holiday shopping season gives cybercriminals ample reason to maximize the return on their campaigns by distributing a new, powerful PoS malware that can capture the credit and debit card transactions of holiday shoppers. The earliest versions of AbaddonPOS are distinguished primarily by fact that it first targets track data delimiters ("=" and "^") for finding potential credit card data instead of a beginning number ("3", "4", "5", and "6"). These actors may have also employed CryptoWall at some point, as the imphash for 227e6b1f3e66f00a4fc683d4f39da904 matches the imphash for a known CryptoWall sample (md5: 2af149845f4d1ce8e712622d3f1ec46e). Both samples are packed, so it is possible that two actors utilized the same packer/crypter or packing/crypting service. author = "Darien Huss, Proofpoint"